A pilot is good or bad because that person is a good or bad pilot. It’s not because they’re male or female, it’s because of who they are. Home » Aviation Articles » pilot careers » Do Men or Women Make Better Pilots? Taking a look at chicks vs roosters in the cockpit, and what makes a better pilot. I wasn’t searching for the answer because I really didn’t think there was one. I discovered it by chance one day when I was a first officer on a B727-200. Because I witnessed the answer with my own eyes, I accidentally became a better pilot. The answer is quite simple: men and women are different. Shocking, I know, but the question to the answer is: who are better pilots, men or women? Despite the myriad of opinions, the answer is always going to be neither, because they’re different. Because of these differences, men and women pilots fly with different parts of their brain and because of that, I can prove that women can be better pilots…oh, okay, I can also prove men can be better pilots too. It depends on the situation so focus now (just the men), and let me explain. As a new first officer on a B727-200, I was struggling with crosswind landings. Since I’d been in the engineer’s seat for a year, I had lost my touch for flying in general and was frustrated with myself that I couldn’t get in the groove of crosswind landings. I could do them, but I had to fight it every inch of the way. We were on the third flight leg of our five-leg day and I had just finished pounding another one onto the runway during a crosswind landing. It wasn’t that bad, just that I didn’t have the “feel” for a good crosswind command of the airplane. I would check the wind on the ATIS and during final, I’d call tower for another “wind check” while simultaneously watching all the wind socks, the tree branches blowing, the birds in the area, the weeds near the runway and if there were any horses below us on the final approach path, I’d check to see which direction their rears were pointed into the wind. I would draw in ten different inputs and make decisions on that instead of “listening” to what the airplane was speaking to me. On the next leg, I watched my captain who had an excellent touch in crosswinds. He had a variable 40 to 70-degree gusty crosswind up to 20 knots. When we turned final, I asked him if he wanted a wind check. He said “absolutely not. That will mess me up. I just watch this little screw that sticks out on the windshield wiper and keep it just a little to the left of centerline.” Wait, what? Really? Just one thing? Yep, he rolled it on. He tuned out all the other inputs and focused on one thing. It was like an addition problem that was figured out for him, and the answer of all that input was at the end of that screw that stuck out of the windshield wiper. That moment taught me how, in this case, thinking like a man might help. I learned I had to refocus on what inputs I was paying attention to. You can’t focus if you’re paying attention to all of them. Being able to draw in and process several environmental senses at one time is predominately a benefit in the cockpit, especially during an emergency, but you have to learn to recognize you’re doing it and to also be able to shift your brain when necessary. The overview of the brain can be narrowed down to four primary variables: how it processes information, its chemistry, structural differences and brain activity. In general, women use nearly ten times more white matter than men, and men generally use more gray matter. According to Psychology Today, “Gray matter areas of the brain are localized. They are information and action processing centers in specific splotches in a specific area of the brain. This can translate to a kind of tunnel vision when they are doing something. Once they are deeply engaged in a task or game, they may not demonstrate much sensitivity to other people or surroundings.” This is why your husband has to turn down the radio in the car to read a road sign. “White matter is the networking grid that connects the brain’s gray matter and other processing centers with one another. This profound brain-processing difference is probably the reason you may have noticed that girls tend to more quickly transition between tasks than boys do. The gray-white matter difference may explain why, in adulthood, females are great multi-taskers, while men excel in highly task focused projects.”1 That’s why your mom can be on the phone, cooking dinner, reading a recipe, and she can still hear when you tell your sister that if you eat the eye of a potato, you’ll go blind. She’ll be in the middle of a sentence on the phone, pull the phone away from her ear, yell at you, and then complete her sentence on the phone call…all while stirring the potatoes in the pot while measuring a teaspoon of salt. Given my lesson with the crosswind landing, it was easy enough for me to reconfigure my brain to reorder the input. I still couldn’t tune out all the input, I just did like my captain and focused on one primary indicator and then used the rest to supplement the input. The result was better landings in both crosswind and normal conditions. If you rummage through the research, you’ll find that only a small percentage of brains will fit neatly into one category of male or female. There is always overlap and in the aviation world, the personality type that is drawn to aviation is a brain that has a stronger control over emotions (oh darn, our engine is on fire versus…Oh My God! We’re gonna die! Our engine is on fire! What do I do?! ), better spatial orientation, and the ability to keep track of multiple environmental cues at the same time – just like a girl. While flying IFR, being able to read all six primary flight instruments at the same time is a benefit, so a male brain is being forced to act like a female brain while in the cockpit. Read that previous sentence again. A pilot brain will also have a stronger hippocampus which is also known at the map reader of the brain. While the male brain might be better at reading a map quickly2, a female brain will remember the map and the routes better and are less likely to get lost. And, if the female brain feels like they’re off-track, they’re more inclined to recheck the map while the male brain will feel more certain that it’s correct, even if completely off-track. So that’s why the answer to the question will always be neither. Female pilots are better than male pilots and male pilots are better than female pilots, it just depends on the moment and the person. In an emergency, the most critical behavior in a cockpit, the balance is that a female brain can more rapidly gather and interpret all the data while the male brain can more accurately evaluate the primary malfunction – but there is always a sequence of malfunctions, so which brain is better? Neither. What is better is having both brains in the cockpit. 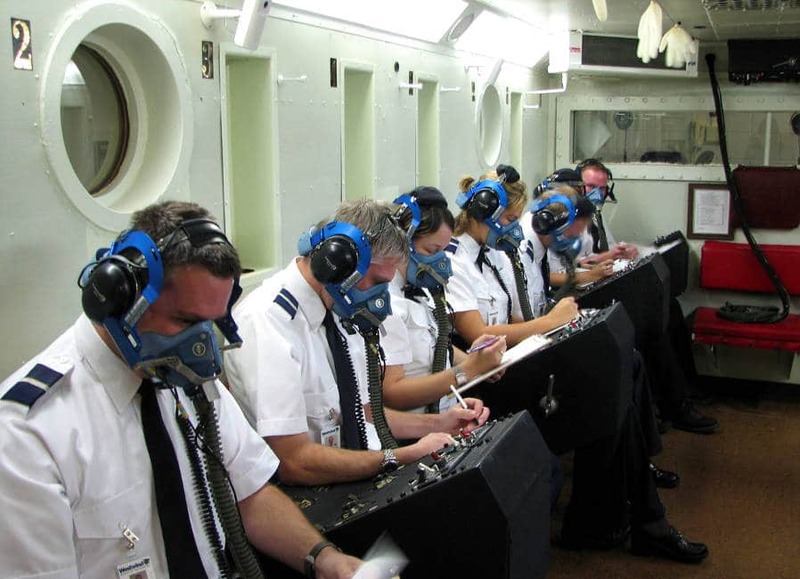 During instrument ground school, pilots are taught the “man” brain way of scanning instruments. There are dozens of questions on the written exam about it, but I tell my students I don’t care if they get them all wrong in my class. The two choices students have are the Primary/Secondary Method or the Control Performance Method. Both force the student to choose one instrument to focus on first and then sequentially use supporting information. Yes, the desired result is to create a scan, but having the brain be forced to sequence the input one at a time is the “man” way and we should be teaching pilots to not focus on anything and take it all in before making a decision. Yes, you can, if you make your brain more “female”. You have to have the ability to allow it all in, and then use the “man” brain to refocus on one answer. The Primary/Secondary method, which was the only approved FAA method for years, makes you choose one instrument to watch for a given flight condition, and then use two other instruments for backup. Yes, they want to call it a scan, but this amplifies the male brain drawback instinct of focusing on one input even though the desired result is a balanced scan of all the instruments. For example, for simple straight and level flight, it’s pounded into your head to look at the heading indicator as your primary instrument. Start there and then go to the attitude indicator and then your turn coordinator. To maintain proper airspeed, use the airspeed indicator as your primary instrument and then the manifold pressure gauge. One thing at a time. The “man” brain way of doing a scan. The second method (Control Performance) is a little more like the female brain way, but it was still designed by a man brain. The concept has the student setting up power and attitude combinations for specific maneuvers. In this method, for example, if the pilot wants to climb at Vy, they would raise the nose/attitude indicator 5° and increase power to 2400 RPM (for this particular airplane). The airplane should climb at Vy with that ratio and then the pilot would verify/adjust the performance by verifying the other five instruments. Of course, the variables are enormous so a generic profile like that will always have you chasing the right balance. That’s fine, because it makes you pay attention to all of it. I vehemently oppose all those questions on the FAA exam about which “instrument would be the least appropriate for determining the need for a pitch change?” Least appropriate? No. They’re all appropriate and students should be exercising and training their brain to take in all the information to get a big picture answer. This old fashioned thought process is what kills pilots in the clouds. If the AF447 pilots had been trained to think like a female brain, they would have realized that the only thing wrong with their plane was that the airspeed indicator was incorrect (initially. Then they added to their problems by trying to fix the wrong thing.) Their A330 entered the ocean with both engines working and absolutely nothing wrong with the airplane. The only error was in the pilot’s head because they couldn’t take in the big picture clues of the situation. Panic creates tunnel vision by instinct, so it’s our job as aviators to retrain the brain to open up to all input during an emergency. The current “man” method of training is amplifying bad instincts. Some of the most satisfying moments of my flying career have been a result of working through an emergency situation with my crew. Nothing is more rewarding than getting the airplane safely on the ground and looking back and realizing you did everything perfectly – not because it was textbook perfect, it was because you worked well with your crew. The checklists never go as planned, there are always an infinite number of variables, but the end result was perfection because the strengths of both brain types guided us out of danger. It’s the balance of both instincts that creates a perspective to more accurately give the situation clarity. 1 – 2014, Feb 27. Brain Differences Between Genders. Jantz, Gregory L. Accessed January 30, 2017. 2 – 2010, May 2. Men Are Better at Map Reading, Faulkner, Katherine. Retrieved January 30, 2017. Photo by: ASU Polytechnic College. Since I was going to be nearby for flight simulator training, my chief pilot wanted me to go check out the high altitude chamber training on the other end of town. I’d never been in one, so I thought it would be a great opportunity to purposely starve my brain of oxygen and feel the results.